If you tend to dwell on distressing events from your past, and relive them in your mind over and again, you will find it difficult to let go of the anger and resentment that they awaken in you. If you get angry and resentful each time you see, meet or think about a certain person who has hurt your feelings, it would not be easy to let go of the anger and resentment you harbor against him or her. If you have guilty conscience about things you did, or did not do in the past, you will most certainly carry anger within you, which will hurt you if you do not find a way to let it go. If you are too hard on yourself and do not forgive yourself for mistakes you did in the past, this attitude would make you unhappy, discontent and sad. You can enjoy peace and happiness, only when you learn to let go of your anger and the thoughts that awaken this anger. A friend once told me that she could not forgive herself for not taking good care of her mother when she got old. That thought kept torturing her, and never let her feel inner peace. I heard someone saying that he would never forgive his sister for not giving him a hand in a time of need, and therefore, each time they meet he cannot let go of his anger and resentment toward her. Another friend once told me that as a teenager, he was a bit overweight, and was often ridiculed by his classmates. Nowadays, though he looks good, he still carries the hurt feelings he experienced in his childhood and he finds it difficult let them go. Whom do you hurt the most when you do not let go of anger, resentment and hurt feelings? Whom do you hurt the most, when you tell yourself, “I will never forgive him for hurting my feelings”? Whom do you hurt, when you refuse to forgive yourself for the mistakes you did in the past? Whom do you hurt the most, when you frequently dwell on unpleasant past memories, and relive in your mind over and again every detail of these distressing events? In all these situations, you hurt yourself and your feelings. A great number of people feel that they cannot forget and let go the past and move on to positive feelings. This is because the negative feelings of anger, hurt and lack of forgiveness are deeply rooted in them, and dominate their life, moods and actions. Do you allow annoying situations, unpleasant remarks and frustration to infuriate you? Do you hold resentments and cannot get rid of them? Find the guidance and instructions to help you to get rid of anger and stop being resentful. “Let go. Why do you cling to pain? There is nothing you can do about the wrongs of yesterday. It is not yours to judge. Why hold on to the very thing which keeps you away from hope and love”? If you are camping and want to light a campfire, you start it with a few twigs, a few pages of a newspaper and a box of matches. Afterwards, to keep the fire on, you need to feed it with more twigs and branches, otherwise, the fire will go out. Anger resembles fire. 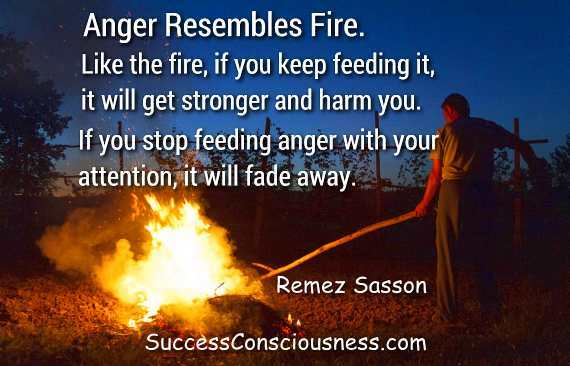 Like the fire, if you keep feeding the fire of your anger, it will grow stronger and harm you. If you let anger occupy your attention, you allow it to grow. If you stop feeding it with your attention, it will fade away. How do you stop feeding your anger and resentment? By denying it your attention, and this you can do by practicing emotional detachment. Emotional detachment is a skill that enables you to let go of distressing and harmful emotions. This skill protects you from getting irritated and agitated by what people say or do, and helps you remain composed and levelheaded in unpleasant and difficult situations, and when in the company of annoying people. Negative emotions stop upsetting you, when you practice emotional detachment, and you remain tranquil and unaffected by them. There are various techniques for developing emotional detachment, and in this article, I will talk about one of them. As said earlier, if you do not feed anger and resentment with your attention, they will soon fade away and stop disturbing you. Do I get upset often? Do I tend to repeat in my mind, over and again, painful scenarios from the past? Do I get angry often? Do I often feel resentment and other negative feelings? If the answer is ‘yes’, to one or more of the question, you need to practice emotional detachment. 2. It would be easier to exercise emotional detachment, when you raise doubts about the necessity of your negative feelings and disturbing thoughts. You have two options, when you experience anger, resentment or hurt feelings. You can allow yourself become agitated, and continue focusing and thinking about the negative feelings, and on the event that caused them. You can let go of your anger, resentment and hurt feelings, by stopping to give them your attention and mental energy. This would be easier, if you ask yourself questions about them and raise doubts about their necessity. Asking questions would take away the energy and intensity of your negative feelings, because you would see how unreasonable and unnecessary they are. With this simple, yet effective technique, you would attain calmness and inner peace. Do I need the anger, distress and unhappiness that I am experiencing? Does anger and resentment add any value to my life? Do my anger, resentment and hurt feelings help me make wiser decisions, or they cloud my better judgment? Is there any reason why I should carry with me any emotional burden, anger, resentment, hurt feelings or guilty conscience? The questions will make your realize that all the negative feelings you are experiencing are unnecessary and meaningless, and this would make it easier for you to let them go. Of course, this will not happen instantly. You will need to repeat this process often, and gradually, you will be able to replace anger, resentment and hurt feelings, with happiness and peace of mind.